- We giving you structural drawings, that is column details, Beam details, rad details etc.. of the proposed plan with applicable charges/sq.ft. Need soil test report provided by the client. STAAD stands for Structural Analysis and Design. STAAD.Pro software is widely used in analyzing and designing structures – buildings, bridges, towers, transportation, industrial and utility structures. STAAD.Pro is the most versatile for model creation and modification because of the text editor facility. In order to cater to the variegated needs of the clients, we offer Piping Drawing Services. Our clients can avail industry specific piping specifications. The services are rendered at reasonable prices to suit the budgetary needs of the clients. We offer our services within specified time frame. - Designing & Detailing of Pressure Vessels, Tanks, Heat Exchangers. - Detailing of various types of Mechanical and Machinery parts. 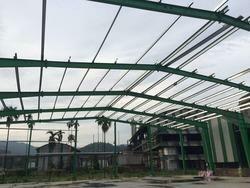 - Roof Truss, Industrial Shed, Tower etc. Structural design is the methodical investigation of the stability, strength and rigidity of structures. The basic objective in structural analysis and design is to produce astructure capable of resisting all applied loads without failure during its intended life. We prepare drawings and bill of materials as an extension of our design services as well as an independent work. We have state of the art drawing and plotting facilities. We have detailing personnel who have extensive experience in detailing RCC and Steel structures. Cad Outsourcing is an India based company providing the Structural services to client globally. Our Structural engineer's can provide creative, sustainable and cost effective structural design through innovative thinking. Steel Construction Detailing is a leading engineering service provider company for Steel Fabrication Detailing, Assembly Fabrication Drawing, all types of Engineering Fabrication Drawings and many more services. Steel Shop drawings for Living Quarter and power upgrade project for Qatar Petroleum – MAYDAN MAHZAM FIELD – PS-2Q and BUL HANINE FIELD PS-3Q. Structural Steel Design is one of the Structural Engineering Services offered at Silicon Info in all around the world. We offer Structural Steel Design Services for all steel building elements such as posts, beams, bracing, and floor and roof panels. We follow strict design procedures including documentation of calculations.